This mazurka and No. 51 are usually linked, owing to their shared key of A minor and their similar dates of composition. No. 50 was written in the summer of 1840 and the latter came in 1841. In addition, both lack opus numbers and were published in anthologies, the first appearing in Six morceaux de salon and No. 51 issued the same year, in Album de pianistes polonais. The Mazurka No. 50 is marked Allegretto, but is somber and deliberate, bordering on the funereal. The slow gait of the melancholy, march-like theme, with its gray, barren textures, would hardly reflect the mood of a composer enjoying a relatively happy time in his life: Chopin's relationship with his mistress, writer George Sand, was at this time still the source of much joy in his life. The main theme is dark and profound, proud, too, in its solemn and cheerless procession. The middle section offers little relief from the gloom, though there is a brief suggestion of emergence from the shadows into fleeting sunlight. The main theme returns to close the piece. 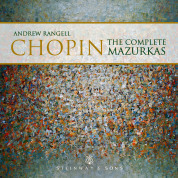 This is one of Chopin's longer mazurkas, lasting about five to six minutes in a typical performance. Such a length may seem unwarranted in view of the seeming lack of variety in the materials, yet the artistic rewards are considerable and will seem bountiful to those appreciating the dark, late works of Franz Liszt.